Romantic, magical – a step back in time. 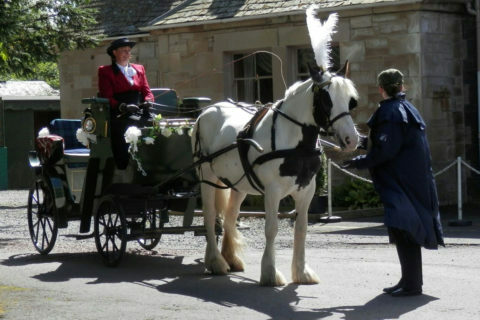 Based in Carrbridge, a few minutes drive from Aviemore and 30 minutes South of Inverness, we offer a variety of Horse and Carriage drives through the historic village and stunning local area in our four-wheeled, open-topped carriage. The slow, relaxing glide of the carriage, combined with the metronome rhythm of the horse’s hooves, just add to the magic! So whether it’s a romantic treat for two or fun times with a friend or family on holiday in the area, you’ll take home some special memories’. Open all year, bookings for our carriage drives are flexible and we will do our best to fit in with your schedule. Contact us today to book your Horse and Carriage experience!